With 10 days left till Christmas, here are my holiday finds to enjoy or to give as gifts. El Buono’s pizza. Bring a 65-inch pizza to your parties and be the belle of the ball! 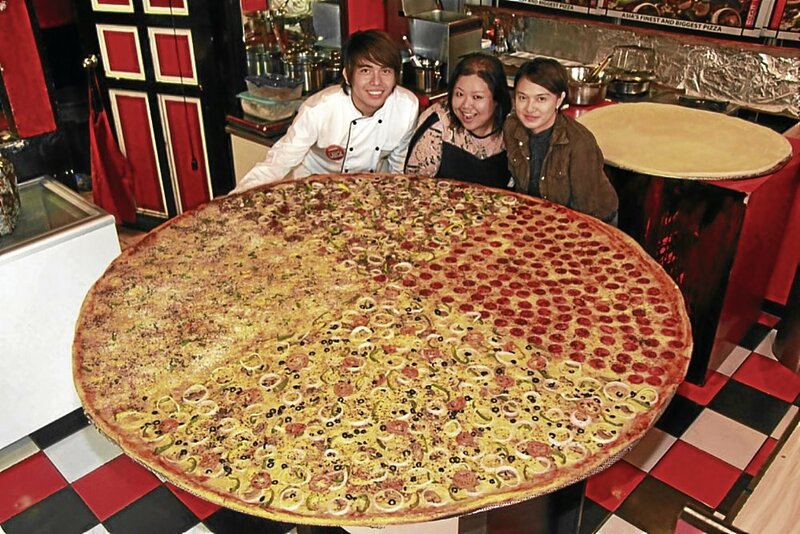 According to El Buono’s Timothy Servida, theirs is now the world’s largest pizza served in a restaurant, made in whole and not in parts. The pizza comes in four flavors of your choice, good for 150 persons, on the average. The resto will deliver directly to the venue. Tel. 2178490 /0917-5961197. Chef Jill Sandique’s Apple Crumble Cake. Cinnamon sugar-coated apples drizzled with caramel, topped liberally with streusel. If you’re an apple person, this is for you. 0917-7777170. Misispi Oatmeal Cookies. Remember the chocolate, violet crumble? “Crumble” is the best description for this cookie, so tender crisp and buttery that when you first take a bite, it seems like a regular cookie, until you bite into it and taste that exquisite buttery finish. 0918-9009631, 7271253. Fiesta Ham and Ice Cream by Merry Moo. A Christmas flavor combining the very best of the Noche Buena table—fiesta ham and queso de bola. But my favorite Merry Moo flavor that I think you must also try is the Salted Caramel! It is to die for—sweet and salty, with a nice subtle bitter-burnt caramel finish. Ensaimada at Tsokolate, Nic’s Parmesan Ensaimada. A mouthful, nice bite, not cotton-soft but buttery and tasty. (Tel 7169321 /7155831) Eat this with delicious Belgian Hot Chocolate Lollipops (heat warm milk, pour in a cup, open your lollipop and mix into warm milk. Voila, your hot chocolate is ready!). Or, for the absolute chocolate experience, try the ensaimada with single Origins chocolate tablets from Ghana, both available at Heavenly Chocolate. 0915-7882105. Dinah Miro’s Lavosh. Crisp, paper-thin, flatbread, perfect for whole-day snacking, in plain, sugar beet, spinach, carrot and tabléa flavors. Excellent with Dinah’s assortment of 12 dips (to name a couple, Creamy Walnut-Basil Pesto Brulee with Coco Sugar, Caramelized Onion and Kesong Puti Brulee with Fresh Arugula), these lavosh make the perfect novelty gifts, from the product itself to the packaging—so beautiful, a la Shanghai Tang. 0920-9603778. Pianono and Cheese Roll. Adalia Uy’s pianono is so sinful. 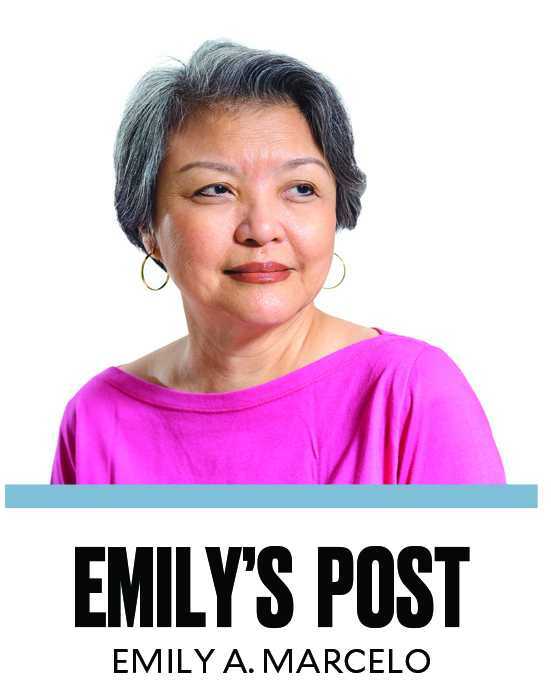 Filled with yema, it is the ultimate indulgence. Her cheese roll I equally like—nice bite, buttery and cheesy. 0917-5366595. Claire Villanueva’s Banana and Apple Walnut Bread. Moist and perfectly spiced loaves that taste just like the fruit. 09189340743. Luxury Congee. Because you asked for it, Ana Ong, maker of the only lugaw I dream about, now delivers to your doorstep for a minimum of P5,000—13 liters of congee with pork, beef, shrimp, chicken, pig’s intestines, fish-fillet (lapu-lapu), meatball and crab balls, leeks, wansoy, fresh cucumber and pickled cucumber. More ingredients: century egg, salted egg, jelly fish, crispy garlic, fried shallots, mushroom, pork blood, fresh egg, fried wanton wrapper, nori, tong chai, crispy tofu and ginger. Plus 10 seasonings: sesame oil, soy sauce, fish sauce, white vinegar, black vinegar, lemon juice, special sauce, chili sauce, red vinegar and hot sauce. Good for 40-60 people, depending on their appetites. 0918-9235879. Perfect Cooker Large. My favorite time-saving, five-liter cooking device is now much bigger at 13 liters. This contraption that cooks my rice in five minutes and makes my beef ribs fork-tender in 45 minutes is perfect for those who cater, have a large family, entertain a lot and always in a rush. 0917-8424140, 0918-9292929. Portable brick oven. Since using Jerry Yu’s brick oven, I have never looked back. Nothing compares to the way it cooks. If you’re a food stylist and you want a perfect roast, this oven is the gadget to have. Everything comes out perfectly golden, with distinct taste. For the season, Jerry has come up with portable ovens: one that can fit a large chicken, and the other a flat pizza oven. They are smaller than his standard versions—a perfect gift for those with space limitations. But to call it portable might be pushing it, unless you’re Superman or Wonder Woman! 0920-5760256. My book “Kitchen Rescue 3, The Directory-My Lifeline to Eating, Cooking and Living,” is available at all leading bookstores. Or call 6474744.